The DJIA tracks the value of 30 major U.S. company stocks. 2. How Many Stocks Are in Dow Jones Industrial Average? 3. What Is an Index Divisor? The Dow Jones Industrial Average is the oldest and most widely followed stock market index. The DJIA tracks the share price changes of 30 major U.S. companies. Changes in the index over time do not include any dividends paid by the 30 DJIA companies. However, total return data for the DJIA, which includes the effects of dividends, is readily available. The value of the DJIA is calculated by adding up the current stock prices of the 30 Dow stocks and applying a divisor. The divisor was originally just the number of stocks in the index, but the divisor has been adjusted over the years to keep the value of the DJIA tracking the stock market when non-market-force changes were made to the index. As of November 2012, the divisor is 0.130216081. Dividends paid by Dow component stocks do not affect the divisor or the index value. 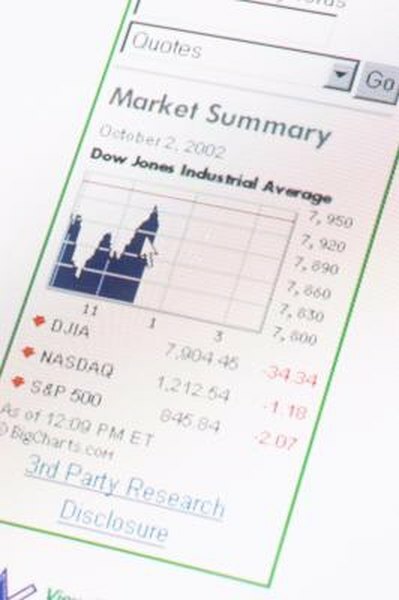 Actions that affect the divisor and thus the calculation of the DJIA include corporate events such as stock splits or if a component of the Dow is replaced. As examples, in August 2012, Dow component Coca-Cola declared a stock split, so the divisor was adjusted to account for the post-split share price of Coke. In September 2012, Kraft Foods was replaced in the index by UnitedHealth Group. To get a total return on the DJIA, the dividends must be adjusted for the divisor and added to the value change. The Dow Jones Company calculates both the returns for the index and a total return with dividends included. The dividends can add significantly to the return earned from the Dow stocks. For example, from the end of December 2010 through the end of October 2012, the DJIA was up 7.19 percent. With dividends included the index would have had a total return of 9.51 percent. The Dow Jones Company also calculates and tracks a DJIA Total Return Index, which includes the effects of dividends earned by the Dow Jones stocks. You can find the DJIA Total Return Index on some financial websites. When Dow Jones started tracking the total return index at the start of 1993, the regular DJIA was at 3,309 and the total return version was valued at 3,977. In November 2012, the DJIA had increased to just over 13,000, and the DJIA Total Return Index had a value over 24,000.